There was an historic showdown in Spain recently when BSB bosses met WorldSBK bosses. The official purpose of this Superbike summit, revealed by BSB series director Stuart Higgs, was to lay down the conditions on which Donington Park would consent to hold the British round of World SBK next year. But when MSV owner Jonathan Palmer meets Dorna owner, or at least sizeable shareholder, Carmelo Ezpeleta you can bet there is more to it than the odd rule change. Last year Donington pitched for MotoGP but lost out to Silverstone. It is also well known that Dorna’s biggest shareholder, investment company Bridgepoint, are interested in selling their 40 per cent stake and that previous owners, CVC, have expressed an interest in repurchase, although little has been heard since The Financial Times first ran the story. The official reason for the get together was Palmer and Higgs telling Ezpeleta they would not be running a British round of WorldSBK next year unless the current format changed. Race fans in Britain, they claimed, were just not interested in having the main event split between Saturday and Sunday. It was seen as poor value, the attendance at Donington had been less than BSB and they weren’t interested in paying money to lose more. Whether he expressed it or not, this was probably music to Ezpeleta‘s ears. Earlier this year he had publicly stated his desire for change but found his more radical ideas not welcomed by the manufacturers. And the series needs factory support for big and small teams alike in order to survive. Some of the changes introduced by WorldSBK director Daniel Carrera, including imposing a rev limit and effectively handicapping Kawasaki, has undoubtedly improved racing but the combination of KRT and Jonathan Rea has made another world championship walkover inevitable. So when the promoter of one of the most important events in a series already short of venues in markets important to manufacturers - can you imagine WorldSBK without a British round - says radical change is required or no deal it gives Dorna leverage with the factories in convincing them that more has to be done despite the progress made and some excellent races seen. What has worked? The technical changes limiting revs have helped to level the playing field, ie the grid, and Yamaha are now real competition to Kawasaki and Ducati, all three having won races this year, with Aprilia getting closer. Whether tinkering with the tech as the season goes on is desirable it certainly irritates the teams. But it is only like handicapping in horse racing, the more successful the horse the more weight it carries. It works there. The presentations and paddock show are excellent, giving fans a closer experience of their heroes and greater chance of seeing what they look and sound like. As are the pit walks where riders sign autographs and make themselves much more available than MotoGP. What hasn’t worked? 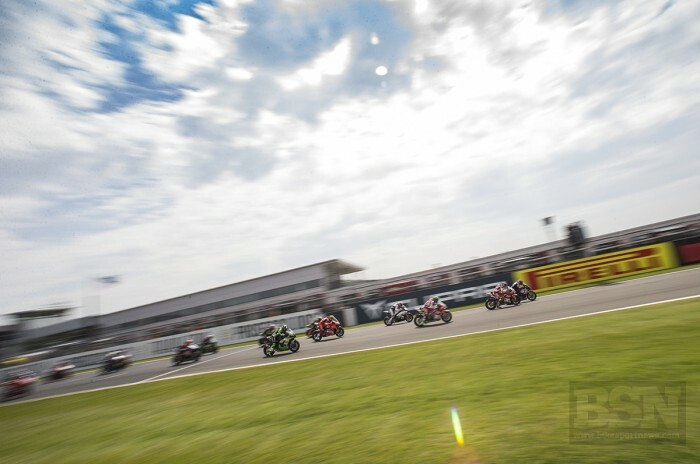 Having the first nine finishers from race one start the second leg in reverse order is not a sufficiently big handicap to stop the likes of Rea who, even from the third row, is usually in the first three by lap three. But we are talking about an exception here so it shouldn’t be abandoned. Hard to say it but the dominance of British riders is a negative all round as they seem to do nothing for the attractiveness of the event, even in their home country. Can’t blame the riders but each country needs its heroes and there are very few in this series other than the UK and they seem to be in BSB. There are at least three out of work riders in MotoGP which Dorna subsidise to transfer to Superbikes. Except two of them are British! Donington was very keen on Carrera’s idea of holding three legs at selected meetings, one on Saturday and two on Sunday, and still are. Unfortunately Kawasaki, still stinging from the rev limit, put the boot in. Most radical is the idea, again liked by Higgs, is a sprint race on the Saturday followed by the main race of, perhaps, 35 laps on Sunday. This would, of course, involve pit-stops for tyre changes and would, almost certainly, not find favour with the teams. But stops, which was forced upon teams at Philip Island because of tyre wear, add to the drama - excellent for TV - and can change the race. And then there is the Showdown, so successful with BSB, which almost guarantees that nothing will be decided until the last round, making the first few rounds no more than eliminators. But it works. So what can/should Dorna do short of closing it down? This is a realistic option for some but the Spanish promoter does have an obligation and is keen to keep going following its acquisition from the Italian brothers Flammini and putting it together with MotoGP. And so, desperation being the mother of invention, it decides to ask the fans. Yes, a survey. So far, so good. But survey company Nielsen seemed more interested in general preferences such as gardening, fashion, home improvement, tattoos etc rather than what fans wanted from Superbike racing. Sexual preferences (five choices) were dealt with early on and eventually participants were asked how many cars/bikes they owned, how much they were prepared to pay for a WorldSBK weekend and what day they preferred. Pity it has to be on a US-owned website whose coverage of WorldSBK is somewhere between nil and zero. But hey, anything is better than nothing and finding out what fans think is a good idea.